Do Luck Direct Ignition Strengthening Kit. The Nissan Skyline GT-R ignition coil harness lives in the valley of the engine. The RB26 is a coil on plug engine, and in the R32 and R33 in addition to the coils there is a ignitor box. On the R34 they eliminate the separate ignitor box, and build the ignitors into the coils. The coil harness is one of a few unique, not shared parts on the R32, R33, and R34 GT-R RB26DETT. The problem is that the coils, and the coil harness gets hot. It gets cooked. If I am racing, I pull the center cover off. Leave the coils open as below. The engine doesn't look as finished, but when you are racing, much better to try and keep from cooking the coils and harness. Often when you are taking an old coil harness off, its crispy, and the connectors break in your hand. Resistance increases with temperature. Electricity takes the path of least resistance, and excessive heat often can cause misfires. Check out this post I did a while back, when I found out about the Do Luck Direct Ignition Harness Strengthening Kit. 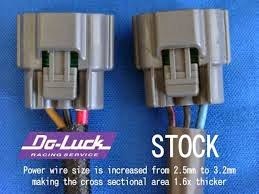 Not only does Do Luck have an upgraded coil harness, they have a direct wire option. The direct wire option adds a relay, and pulls 12 volt power directly from the battery. Do Luck Direct Ignition Strengthening Kit relay mounted in an R32 GT-R. The install is straight forward. Remove the old coil harness. Install the relay for direct power from the battery. Plug in the new harness. If you don't know when the last time your ignition system was maintained, then this is a good idea. Buy one here in the US at this link. While you are in there, put a good set of spark plugs, and do the coil pack fix as detailed here. RB26DETT Ignition System troubleshooting.